- right or left handed. * Fast operation: Opening/closing in 3 seconds. 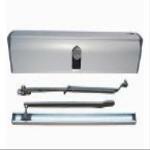 * Up to 120 Kg door weight. * Maximum door width: 1200mm. * Push & Go function. * Adjustable opening, pause and closing times. * Operating modes: Door Free, Automatic, Held open. * Self learning set-up and reset. * Obstacle detection (adjustable cycles). * Built-in battery back-up: 12V dc 1.3Ah.